Have you seen the latest? 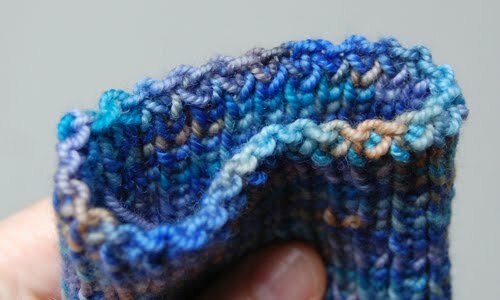 In April 2011, Interlock Bindoff was published on knitty.com. Here’s a video I just put together as a demo. Some of you might be wondering, what gives? Why is Jeny so obsessed with stretchy bindoffs? A couple of years ago Jeny's Surprisingly Stretchy Bindoff was published in in knitty.com. I've been thrilled with the response, for the most part. But for the most part is a key caveat. Some people hated it, which kindof kept me up at night. The folks I know who have more publications to their name tell me not to sweat it. "No one can please everyone," they say. Which is true. But since I make my living seeing the world through the eyes of others (my clients, my students, my 2 year-old, etc. ), and since I am an insatiably curious person, I decided to examine the point of view of these knitters who didn't have great experiences with JSSBO. Maybe I could learn something from this? My primary finding of interest was that some folks disliked JSSBO's appearance. I think it's pretty, but that's a subjective opinion. However, it's a fact that JSSBO is quite visually prominent, so I wondered if I could come up with something that was just as elastic and snapped back just as well as JSSBO, but blended into the fabric more organically. Achieving high elasticity without flare was the real challenge here. Since most cast ons don’t seem to have the same issues as bindoffs, I approached this challenge via reverse-engineering. Deconstructing the simple loop cast on is what ultimately led me to Interlock Bindoff. I discovered a few months ago (ironically, just a couple days before Interlock went live) that I was not the first person to explore this topic. Those of you who are familiar with the brilliant Skew sock pattern will recognize the other intrepid explorer as our very own Lana Holden, who apparently is my evil twin in many respects, not just knitting. All this said, I hope you’ll give Interlock a try. It’s a bit more fussy than JSSBO, given that it’s sewn. But for things like socks and cuffs that don’t have a ton of stitches, it’s the one I always use now! Can't wait to give it a try, though I do like JSSBO. I also think the JSSBO is pretty, a definite plus when the functionality is considered. I really dislike using a needle to finish sock ribbing. Thanks for your contribution to my knitting. 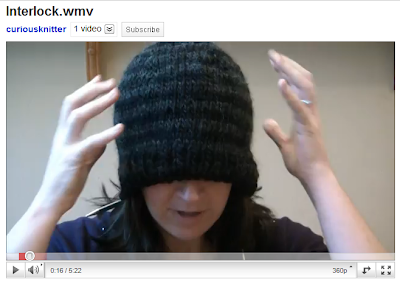 I tried the Interlock bind off at the behest of my LYS owner, who liked it very much. I am in awe of your problem-solving ability and your ability to visualize but (I do hesitate to say it as I don't want you to lose any sleep over it) I prefer the look of JSSBO- as you say, purely subjective. I enjoy following your thinking as you explain your techniques. Thank you. I am pretty psyched to have come up with yet another bindoff with a whole different personality. I am also psyched that I now have a greater understanding of bindoffs in general, and what gives different bindoffs their unique characteristics. Totally fun rabbit hole to dive down for awhile! This is a really old technique that I have been using for 40 + years. I am an off and on knitter though and googled to find a refresher course and I am really glad that you did re-invent it :D Really couldn't tell you where I found it the first time, but I didn't invent it! I am many things: mom, wife, usability geek and data junkie, and insatiable maker of functional items.